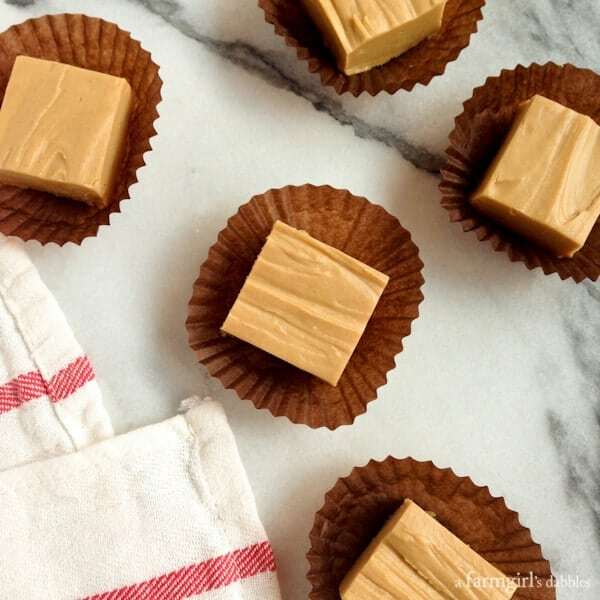 This Foolproof Peanut Butter Fudge is super quick and easy to make. And it uses just two ingredients. How awesome is that?! 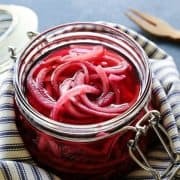 I’ll admit that I’m a skeptic when it comes to recipes that brag about using just a few ingredients, while promising that the finished product actually tastes good. While I love having easy recipes in my back pocket, with minimum prep and clean up, I also know that many times shortcuts just don’t cut it. Those dishes oftentimes feel a little thin, like they’re missing something. They leave me yearning for just a little more somethin’ somethin’. But somethin’ about this recipe for Foolproof Peanut Butter Fudge, with just two ingredients, had me curious. And with not much to lose in both time and money, I set out to prove myself wrong! This incredibly easy recipe comes from Laura Powell‘s new book, Christmas Desserts. I first met Laura last summer in Chicago, where we were on a kitchen cooking team together. We seemed to laugh at the same things, question the same things. I liked her. So when she asked me recently if I’d like a copy of her new Christmas book of desserts, I told her that I most certainly would. This book would make the perfect stocking stuffer. With just 20 easy recipes, Laura’s book gives you plenty of variety without being overwhelming. 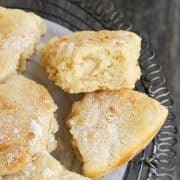 Of particular interest to my own taste buds were recipes for Eggnog Cookies, Chewy Gingerbread Bars, and White Chocolate Cranberry Orange Bars. 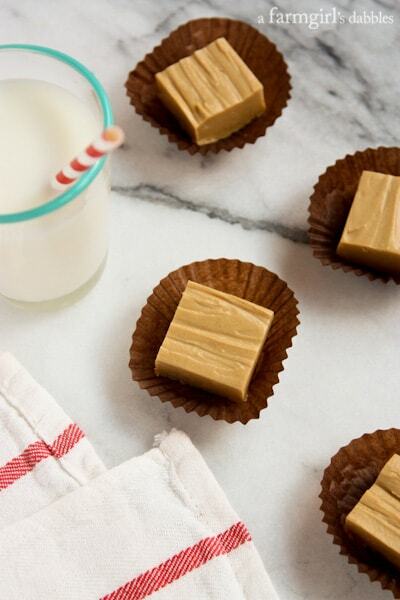 And, oh yeh, this peanut butter fudge that uses only two ingredients. When I removed the fudge from the pan, holding onto the foil lining, my doubts started to ease up, though. The peanut butter fudge was nice and firm, yet soft. The knife cut through it like thick butter, with smooth, clean lines. My perfectionist self was loving the thought of sharing these beautiful little cubes on a holiday platter. Yes, this two-ingredient peanut butter fudge was a hit. We all loved its super creamy texture and peanut butter flavor. And when my parents were visiting us a couple weekends ago, I served some fudge to them without revealing anything about the humble ingredient list. After just one bite, Mom asked me for the recipe. She could not believe that yummy concoction was made from a container of peanut butter and a container of vanilla frosting. I know that some will argue the qualities of this being a true fudge, but I really don’t care. It’s quick. It’s easy. It tastes delicious. It proved me wrong. Line a 9″ x 9″ pan with foil and set aside. 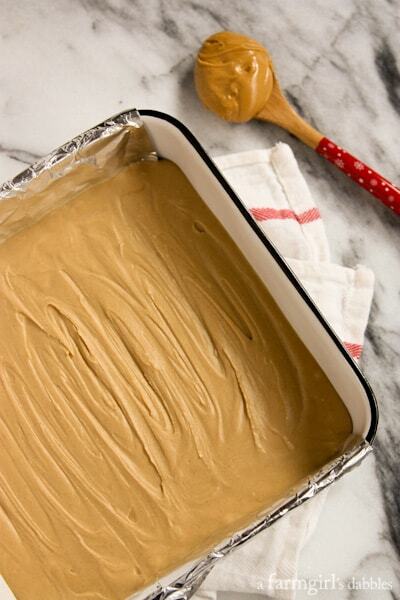 Add peanut butter and vanilla frosting to a medium sized microwave-safe bowl. Do not stir. Microwave for 1 minute, then stir until combined and completely smooth. Pour into prepared pan and spread evenly. Place in refrigerator until firm. Remove the fudge from the pan using the foil, and then cut fudge into squares. This fudge is very creamy, with a texture that is a bit softer than traditional fudge. It’s oh so good! The fudge freezes well, too. Just place it in an airtight container with layers of fudge separated by wax paper. Recipe from Christmas Desserts by Laura Powell. Love this easy to make “fudge”. Does it have to be kept in the refrigerator? Someone else asked, but I didn’t see an answer. Thanks. I have an allergy to the milk in the frosting. Would it turn out the same substituting it with soy milk? I’ll see how well that works. Emily Lucille commented that Pillsbury frosting has no milk products in it. Check out the label. It might work for you. The Duncan Hines Creamy Homestyle Classic Vanilla does not appear to have any milk products in it, as well. I would like to try this, wondering if it would be ideal for school lunch boxes too. I live in Africa, and I don’t know if we have ready-made vanilla frosting in the shops. Haven’t seen. Any suggestion as an alternative. I was thinking Nestle caramel. I’d like to give that a try today. This is just meant to be a very quick recipe for fudge. The caramel would create a whole different consistency, not like fudge. Saw this recipe on Facebook but it says to use a 28 oz jar of peanut butter. Which one would turn out better? Made this for Christmas, the hardest part was removing frosting and peanut butter from the jars. My family said it was the best I ever made. Wonderful! So glad you liked this! Help! My Microwave died on Thanksgiving morning, can I just heat on the stove briefly? I’m sure that would work just fine – just don’t let it get too hot! I made this last nite with 1/2 container of cream cheese icing with peanut butter to taste. It is delicious! I wasn’t expecting how good this is! Make it, you will love it! Merry Christmas! Love this fudge! I cut it into small squares and dipped into melted dark chocolate, then topped with Christmas sprinkles. Delicious and so pretty!! Hello :) I’m so excited to try this! I’m wondering, how do you store fudge and how long does it stay? This looks awesome! If gave this to people for Christmas in a tin can, would they be good after sitting around in a warm house for a while? Or would they melt? I don’t think these would totally melt, but they would be extremely soft. I was doubtful of this recipe – good fudge is hard to come by and making it with frosting? No way. But I have had to go dairy-free for my daughter’s milk protein sensitivity, and since Pillsbury’s frosting has no milk products, I thought I might as well give it a try (there are very few sweets I love that don’t have milk!). Thank you, thank you, thank you. This recipe was phenomenal. I made it with cream cheese frosting and a natural peanut butter (so it would be more peanut-buttery and not so sweet). This fudge reminds me of what Grammy used to make – a fudge that no other fudge has matched since! So delicious, so easy, and so dairy-free. This will be a staple at my house! Made this today…super easy and everyone loved it. Can’t wait to see what combinations everyone else made. I had a can of cream cheese frosting but didn’t know how that would work…I see someone else tried it with success. Subscribing now to your blog. Have you had anyone report in any success using sugar free frosting? I’ve always heard that aspartame loses its sweetness once you heat it up. I hate to cook, but I am always looking for easy ways to make my family think I am good at it! I tried 2 versions 1.) vanilla and 2. 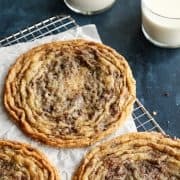 )Pillsbury triple chocolate chip- yum! We liked both, but the chocolate was more to our liking. This is going in my recipe book! Thanks! So glad you liked this, Michelle. Happy Thanksgiving! Just made this with chunky peanut butter and chocolate icing. Everyone loves it. LOVE this combo! Thanks for letting me know. Happy Thanksgiving! I made this tonight and since I love cream cheese I used cream cheese frosting …amazing it is like peanut butter cheesecake..Love this recipe. Wonderful combination, thanks for letting me know! Where do you get one pound of frosting? My containers are 12 oz. The containers I find are all 16 oz., found at various grocery stores, Target, etc. Aran, there always has to be a negative smart Alec ! Of course people who have to watch ingredients Aready KNOW to look at the ingredients in anything!!! Also I love crunchy PB and I had thought of using chocolate frosting . Any flavor would be worth trying! If it turns out too thin use for a topping on ice cream,sheet cake etc! Or add powered sugar and microwave for a min and that would be 3 ingredient fudge!!! Great to hear from you, Gran. People are starting to comment with the different combinations they are using, so fun! There are a ton of ingredients in “vanilla frosting”, depending on what brand, and all of them may have serious implications for allergy sufferers or those who need to avoid dairy … Quick and easy but not “two ingredients” please. Could you use chocolate icing? Just made this awesome fudge! One note I made is to make sure your frosting isn’t the whipped kind. It turned out more soupy, but the original worked great! 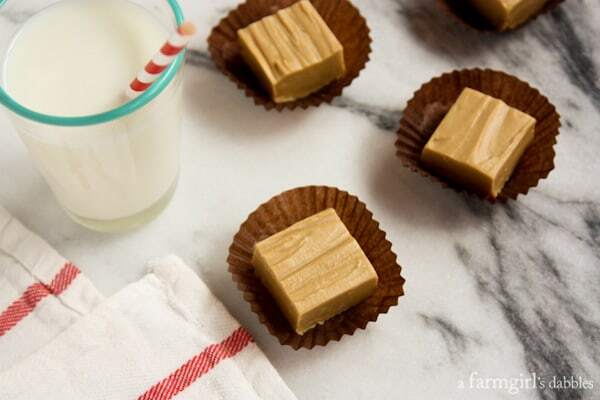 Thanks for the new go to recipe for peanut butter fudge…it’s so much easier than my old one! So glad you liked this, Heather. And thanks for the tip! Wow! 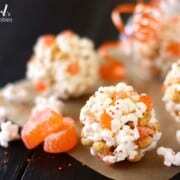 This is seriously the easiest recipe I have ever seen! What a perfect Christmas goody! Hi Kay – I have not tried that to tell you for sure, but I do think it’s worth a try! Please let me know if you make it. as we live overseas, what do you mean by “vanilla frosting”? as in stuff out of a jar? betty crocker stuff? 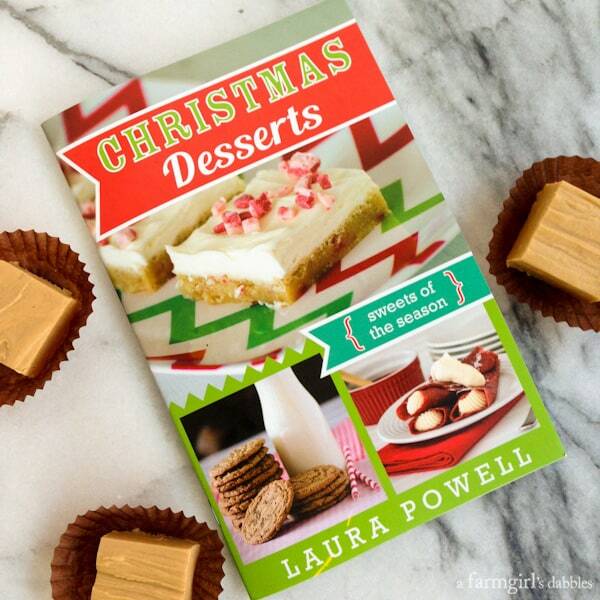 Pingback: BLOG TOUR with review…CHRISTMAS DESSERTS~LAURA POWELL… | My Book Addiction and More! Hi Paula! Agreed. Sometimes we just need quick and easy! My boyfriend keeps asking me to make fudge and I keep saying yes hoping he’ll forget. This sounds so simple and so easy! I’m going to give it a go tonight! I hope you both like it! So easy…and SO dangerous! It looks delicious! You had me at two ingredients. So simple. YUMMERS!! 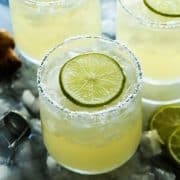 I love that this only has TWO ingredients too. So glad you liked the fudge Brenda and love how you were keepin’ it real with your post. Love your photos too! Thanks so much friend! I’d forgotten about icing fudge! Yay! I am “in” on making this with your taste and texture approval Brenda! It is kinda dangerous to have around!! 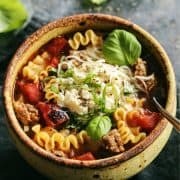 This looks so yummy, I would never guess it was so easy!!! two ingredients?? that’s crazy, but they sure do look good! is it possible to make this with frosting made from scratch? I would think a homemade frosting would work fine, but I have not experimented with any homemade frostings for this recipe. Mmmmmm — could there be anything more perfect than peanut butter and HOW STINKING EASY this recipe is?!? Love it!! FUDGE…. I love you. 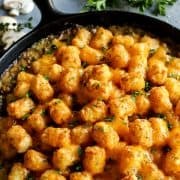 And I love this recipe! Oh my, this looks delicious! My husband is going to love it. He’s obsessed with all things peanut butter! 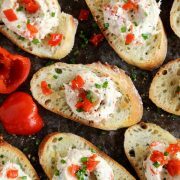 It’s good to have a few easy recipes around for the holidays!